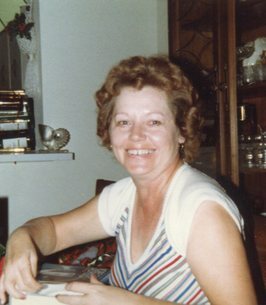 Carol A. Cable-Dion, 81 years of Hillsboro, passed away on Tuesday October 16, 2018. She was born in Dayton on April 21, 1937, the daughter of the late John G. and Myrtle May (Franer) Cable. Besides her parents, she is also preceded by her first husband, Bill Vasiloff, second husband, John Dion, six sisters, Geneva Dempsey, Sally Burgess, Lucille Jones, Eileen Kennett, Helen Hatch and Betty Wyatt and four brothers, James, William, Richard and Robert Cable. Carol is survived by her two daughters, Pamela (Raymond) Bray of Hillsboro and Christine (Martin) Clough of Colorado, six grandchildren, Lori Bray, Kevin Bray, Chrissy Bray, Jennifer (Alex) Mowery, Kathleen Clough and Matthew Clough, great granddaughter, Riley Mowery, brothers, Leroy “Eddie” Cable of Hillsboro and Floyd Cable of Dayton and several nieces, nephews, cousins and a host of friends. A Celebration of Life will be held on Saturday October 20, 2018, 2:30 PM at the Hillsboro Bible Baptist Church. A Gathering of Family and Friends will start at 1:00 pm until time of the Celebration on Saturday at the Hillsboro Bible Baptist Church. Burial will be at Valley View Memorial Gardens in Xenia, Ohio. Donations can be made to the St. Jude Children’s Research Hospital. To send flowers to the family of Carol A. Dion, please visit our Heartfelt Sympathies Store.